I'd like to share a little card I did for one of my Convention Swaps. I'm showcasing the Beautiful Venetian Romance Designer Paper and the New (not yet released) "Wishing You" Stamp Set that will be Available to you August 1st from the Holiday Catalog. I decided it was too early for Christmas so made a Birthday Card instead.....what do you think? The colors are some of the New In-Colors which I love.....Coastal Cabana, Baked Brown Sugar and Pistachio Pudding. It goes beautifully with the Designer Paper and the Ruffled Ribbon I think. 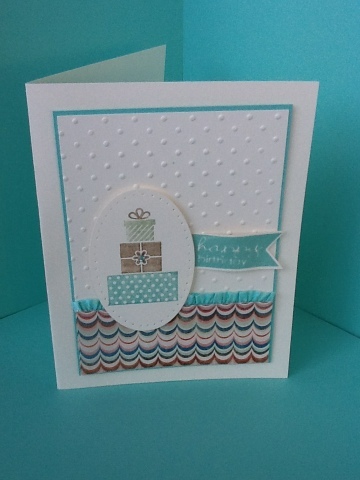 I also used the banner Greeting Set that is a Hostess Set in the Big Catalog to finish it off. I hope you like it. Don't forget about the Designer Series Paper Special going on until the end of July....Buy 3 get 1 Free on pages 151, 153 and 154. It's such a great deal. Thanks for stopping in today...see ya next time! This is so gorgeous!! I love the colors and that paper is super cool.